Giddha is popularly called a Lokh Naach for people in Punjab specifically for women. It majorly derived from an ancient ring dance, which was performed by Punjabi women at social gatherings. Giddha for women is bright, colourful and energetic dance which is usually performed to rhythmic clapping and Boliyan. Giddha is a very vigorous folk dance and like other such dances it is very much an affair of the legs. The movement is very quick of the feet in its faster parts that it is difficult for the audience to even wink till the tempo falls again. Women with embroidered duppattas and heavy jewelry participate in many numbers which are unrestricted which further exaggerate the movements. One of the women participants generally sings the bolis and when the last but one line is reached by all of them, the tempo of the song rises and all start dancing. In this manner bolis are coordinated with the dance sequence which continues for a considerable period of time. Giddha is a very vigorous folk dance of Punjab as compared to other ones and it ver much involves an affair of the legs. So quick is the movement of the feet in its faster parts that it is difficult for the spectator even to wink till the tempo falls again. The dress of the dancing people include the embroidered 'duppattas' and heavy jewelry whose number is unrestricted and further exaggerate the movements. Mimicry is a part of Giddha dance form. One girl may play the aged bridegroom and another his young bride for fun or one may play a quarelsome siste-r in- law and another a humble bride. Today in India Giddha is mostly performed in the city of Amritsar, while in Pakistan it is being still popular in Lahore. The traditional dress worn during giddha dance is short female style shirt (choli) with ghagra or lehenga or an ordinary Punjabi Salwar-Kamiz, rich in colour, cloth and design. The ornaments that they wear are suggi-phulto pazaibs (anklets), haar-hamela, baazu-band and raani-haar.The Traditional dress for gidda is quite elegant for the women. It adds more charm to feminine grace and is comfortable enough to allow women to perform giddha dance with ease. Giddha dress is quite simple and one can find women in rural Punjab donning it everyday. The only difference is that costume for giddha makes use of brighter colors and is complemented with heavy jewellery. This dance translates into many gestures, bolian-verses of different length satirizing politics, the excesses committed by husbands, it might be their sisters and mothers, or the loneliness of a young bride separated from her husband, even the evils of society or expressing guileless deep love. Gidda dance is stylistically simple with the jingle of the bells, thumping of the feet, along with the beat of the drum and the resplendence of Punjabi women in salwar kameez creates an enchanting atmosphere for people visualizing it. Giddha is so popular because it is not performed according to any cut-and-dried rule. While the harmony is the essence, in gidda movements that are inclusive of swinging and twisting the body, involving shaking of the shoulders, bending to a double and clapping. Giddha dance incorporates in it the village life scenes of woman spinning, fetching water from the well and grinding. The Gidda is danced by women and young girls on family and festive occasions. The girls and women form a circle, with one of their number in the center. 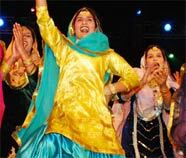 Gidda is womens exuberant dance forms. In Gidda the dancers enact verses called bolis usually representing folk poetry at its best. The subject matter of the bolis range widly from indeed everything in daily life like arguments with the sister-in-law to political affairs figure in these lively songs. Along with the drums, the rhythm of this dance is set by the distinctive hand-claps of the dancers. Marottichodu, Edappally PO, Kochi 682024.